When time is short, the weather is hot and you are hungry for a real meal I find a stir fry can be a great choice. It allows me to use whatever is in the fridge and pantry to create a fresh wholesome meal. For a starch my go to choice is often rice noodles, they come in skinny to very wide size and are so easy to prepare. They take on the flavor of the rest of the dish which can be handy; no flavor conflicts here! This version I am sharing today is a pork stir fry with those delightful medium to wide rice noodles you can get these days in most grocery stores. I soak them in very hot water for ten minutes and drain well before stirring them into the completed dish. Foolproof. Notes: the veggie amounts are very fluid; use more if you like a lot of something or skip if you hate. And sub in other things if you dislike any of the veggies I used; other choices are broccoli, onion, or snap peas. Best made in a wok; I have a small one I use all the time. I guess you can use a fry pan; keep it hot and stir constantly. Directions: Put the noodles in a bowl half full of very hot water; I heat it in the microwave until almost boiling. I break them in half before putting in water; up to you if you like long strands. Let stand ten minutes. Meanwhile, cut the pork up into thin slices or chunks; nothing that can’t fit easily into someone’s mouth, sprinkle it with the dried ginger. You can also sprinkle it with meat tenderizer if you like; I would put that on before the ginger. Heat mini wok, add oil. Add pork and stir it after a minute; start flipping over; brown all over lightly; 3-4 minutes. Remove to a plate. Add celery and carrot, stir a minute or two then add cabbage, stir a minute, add the zucchini and garlic; stir 2 minutes then add the bok choy, stir 1-2 minutes. Add the pork back and the fresh ginger slivers. Cook 2-3 minutes, stirring constantly. You want the veggies to be a touch crisp but mostly cooked. Pour in the cornstarch water slurry and 1/2 tsp. soy sauce. Stir well and add the drained noodles; keep stirring as it cooks for one to two minutes; add more water if not enough sauce to your liking. This last minute is critical to make the sauce clear; you need to cook the cornstarch. Taste and add more soy sauce if you want, also, season with salt and fresh black pepper to your liking. I often use fruit juice for some or all of the water. Pineapple is my favorite but orange juice works well for some of the fluid; adds a lot of flavor. Should serve 3 people. This is a naturally gluten free dish. If you dislike the rice noodles service it over rice. Enjoy! Two summers ago, on a hot day, I realized there was a quick and easy way to make an ear…or two without that big hot pan of water and steam. I just take a large frying pan, put a quarter inch of water in it, sprinkle of salt and let it heat until bubbling. I then lay in my ear or two which I have husked and removed all the silk. Then the pan is topped with a lid or an empty pizza pan if your frying pan is too big for your lids. Cook it the usual time; depends on how fresh the corn is. The fresher your corn ears, the less cooking time you need. The steam in the pan will cook it really fast. Maybe 6 to 8 minutes. Serve your ear(s) with salt and butter and enjoy fresh corn without heating the kitchen up much. Oh and I have some lovely prong thingies my sister gave me for pushing into the corn so my fingers stay cool as I munch corn. Great idea. Get them! Mine are plain like these; they do make corny looking versions but I prefer these simple looking ones. Mongolian Beef Stir Fry: Awesome! Don’t know why but I’ve been totally craving Chinese food lately. Quick stir fry meals served over rice, with rice noodles. With lots of veggies. With beef, chicken, tuna. You name I crave it! And I make it ‘cause there isn’t any gluten free Chinese restaurant within easy reach of my house. So when I saw this recipe for Mongolian stir fried beef I knew I wanted to re-create it. I confess I made changes. Yeap; I did. Honestly, I almost always change recipes some. Just the way I roll. This time I added lots of veggies and took out the deep frying aspect. Oh, and I took most of the brown sugar out. ¾ of a cup of brown sugar is close to insane in a stir fry. Just trying to keep things healthy folks. And it worked. Yummy meal over rice and no guilt because low in fat, sugar and full of healthy vegetables. Sure there is beef in there but not that much and it is lean rather than fatty meat. I used beef sirloin but the original recipe off of food.com used flank steak. Use whatever cut of beef you like, if it is too chewy it will give you a chewy result; this is not a low braise but a fast stir fry. I used plain sesame oil (not toasted!) but canola or mild olive oil both work well in rapid stir fries. So stop whining about there being no P.F. Changs around here. You can do this, it’s not that difficult. You do need a wok if you want to do it half decently. And yes, a gas range works hugely better for woking. I have a big one but my favorite kitchen pan is my baby wok. Makes up to four servings in it easily and fits on burner a heck of a lot better than my big old wok from years gone by. You can use a big one but honestly, my baby wok does 99 percent of my stir frying. If you need to double this recipe, well then maybe you need a full sized wok. But for 4 or less; small is best! You may wonder why I need to make this recipe myself and call it gluten free when there is no naturally occurring gluten in it. Well, a lot of soy sauces have gluten in them. And a lot of Chinese restaurants do not prevent cross contamination. If you have celiac even a tiny amount of gluten is a serious problem. So I really can’t chance eating food from a Chinese take out place or most restaurants unless I am sure they understand this issue fully and can make truly safe food for me. Annoying for sure as sometimes I do miss eating Chinese take out…. For now though, I am more than satisfied by the authentic flavor of my new fav stir fry dish! Sprinkle the ginger powder over the cornstarch on a sheet of wax paper, stir around. Roll the beef pieces around to coat them well. Let stand while you cut up the veggies, up to ten minutes. Heat the cooking oil in a wok to almost smoking hot. Add the beef. Cook a couple of minutes on the first side, stir up and cook a couple more minutes. The heat should be fairly high to cook things fast. You want the meat to get crusty but not hugely overdone. Remove to a plate; cover to keep warm. Add another tbsp. of oil to the same pan. Throw in the cut up onion and carrots. Stir a minute. Add the celery slices. Stir another minute. Add the broccoli stems, stir and then throw the rest of the broccoli on top. Add 2-3 tbsp. of water and let steam a minute or two uncovered. Add the garlic and fresh ginger. Cook a minute. Return the beef to the pan, dump the brown sugar on top, add the soy sauce. Add the green onions if you want some, I went without this time but I plan to add them next time I made this yummy meal. Stir a minute or two. Add more water to create sauce if there isn’t enough. Serve over brown rice or white rice. Note, these stir fry times and amounts are flexible. If you don’t want one of the veggies leave it out or sub in something else. If you want more soy sauce or more sugar; add more and taste to see how you like it. I like things a tiny bit crunchy; taste and see if you need to cook another minute or two before you turn off the burner. I find stir frying rather freeform and fun. It can use what you have available in your fridge and pantry. I also would like to try this dish made with chicken. Enjoy! Original recipe inspiration from food.com. I Be Feeling Sick Chicken Soup! When you feel ill, like with the flu, a cold, an icky stomach bug, or if you get glutened, you want to eat something warm and soothing. Something healthy that will stay down and feel happy in your tummy. Something like homemade chicken soup. 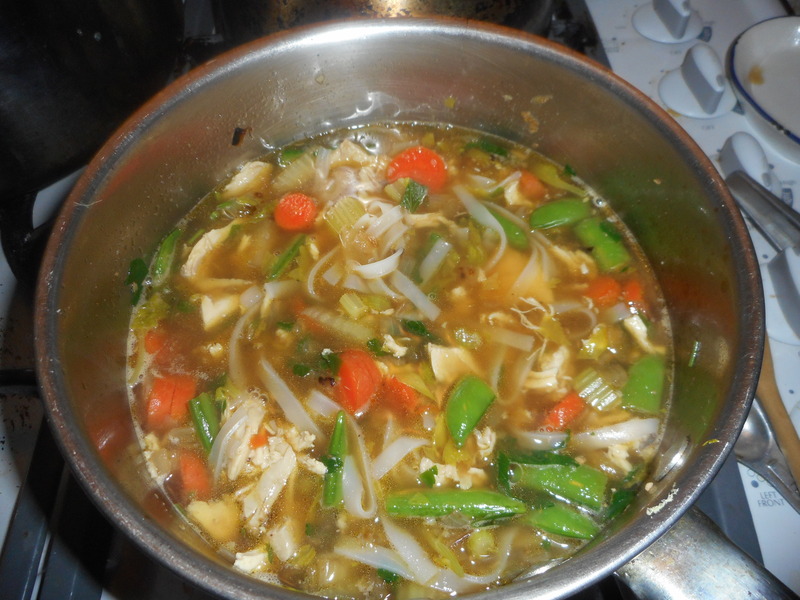 That is where I was at when I made this Oriental chicken soup. I was gutened by something the day before and still felt not well enough to eat regular food. So I whipped up a small batch of fresh soup with homemade chicken broth I had leftover from this past weekend. This soup took less than 30 minutes, some of that actively chopping and some just allowing it to cook. Just the ticket when you are under the weather and have no pre-made soup to reheat: whip this up and you are set for several delicious meals. I suppose you can make this soup with canned broth; be sure it is gluten free if you have celiac disease like I do. Homemade is going to make it more flavorful but sometimes you just don’t have time to make fresh broth. And if you don’t like sesame oil leave it out. 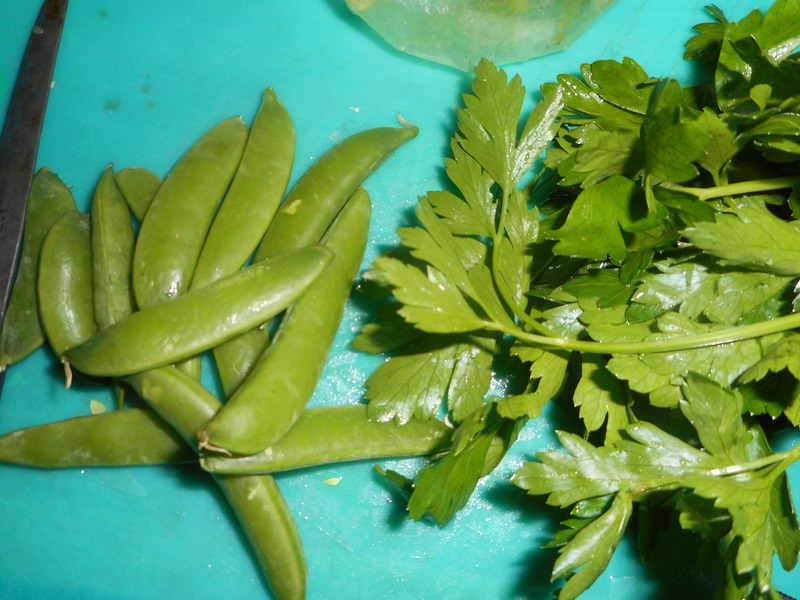 The pea pods, onion, ginger, garlic, parsley and celery leaves are very healthy additions and they each add great flavor. Ginger is particularly good if your tummy feels poorly. I often keep a bit of it frozen in a freezer ziplock baggie so it is there for a quick grate into a dish. I like the pad thai noodles; made of rice so they are easier on the tummy than egg noodles. Don’t freak out if you only have one carrot or don’t want as much of any ingredient; make it your way. I sometimes fail to measure as I make soup so some of these ingredients are a bit fluid. As a young adult I would ask my mom to give me her recipes and got very frustrated by her un-measuring way of cooking. These days I estimate or eyeball some ingredients. Use your good judgment and what you have on hand in your pantry/fridge. If you don’t want meat in it; leave it out. If I am really ill I do that; easier to digest without that protein. You could buy a rotisserie chicken but if you are gf; check the labeling; not many stores make gf rotisserie chicken. I used leftover roasted chicken breast from a family supper. 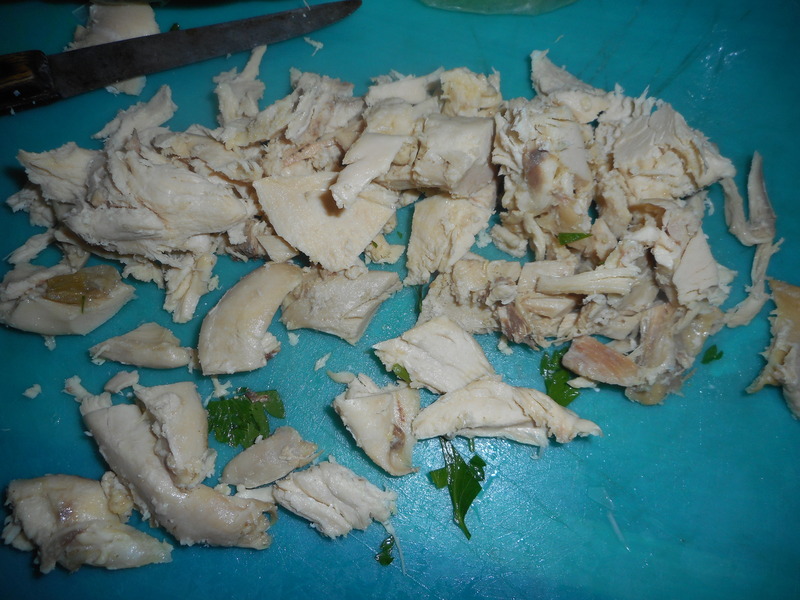 Roasted chicken has a lot of flavor compared to steamed or poached. Heat the olive oil in a large saucepan; I used a two quart one. Add the diced onion and carrots. Cook the soup, stirring frequently; about 2-3 minutes. Add the celery stalks and the minced garlic clove, cook approximately 3 more minutes. Add the broth which you have heated. Stir and add the fresh ginger and sesame oil. Heat 1.5 cups of water in a microwave safe container and add the rice noodles. I like to break them up somewhat or they are a mess to slurp down. Up to you! Let them stand ten minutes while the soup cooks. Cook the broth and veggies 8 minutes, add the celery leaves and pea pods which you coarsely chopped. Cook 3 more minutes. Add sea salt to taste and the chicken breast. Stir and heat a minute or two. Taste and adjust the salt. Add fresh ground black pepper to taste. Pour in bowls. I topped mine with some pea pod micro greens I grew in a pot at my kitchen windowsill. Perfect meal when you want to sooth an iffy tummy.